Nutraid solution for consultants, helps food technology professionals, HACCP consultants, and dietitians substantially reduce the time and effort in calculating nutrients and creating compliant food labels for their clients, according to EU 1169 or FDA standards. The software’s user-friendly platform enables immediate recipe creation and label production, with automatic indication of allergens, insight to abundant nutritional information, automatic water loss, traffic light, costing and more. 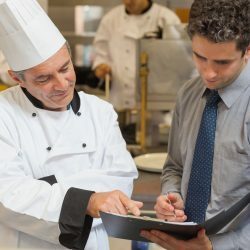 Smart recipe management including addition of specialized ingredients and sub-recipe reuse, facilitates quick product updates and optimization of your recipes. Unique to Nutraid, automatic label translation is available in 7 different languages, including creation of multi-lingual food labels for export. Consultants can purchase a pay-as-you-go license to use Nutraid for as many recipes and labels as needed, with minimal training, no installation, and free on-going updates. Contact us to try a free demo.